Welcome to the Global Awakening. 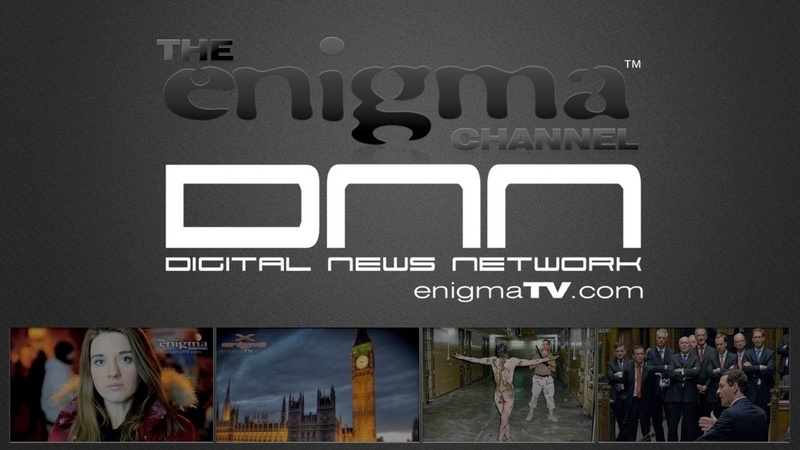 The Enigma Channel is the world’s first global TV station, broadcasting via the web since 1998. You can watch documentary films from anywhere in the world, on any device, without any set-top box. I made my first documentary film in 1997 exposing the fact that small spherical lights were being chased by British Army helicopters near Stonehenge. My investigation led me to a conspiracy of VIPs, government ministers & military people who were all members of Freemasonry. 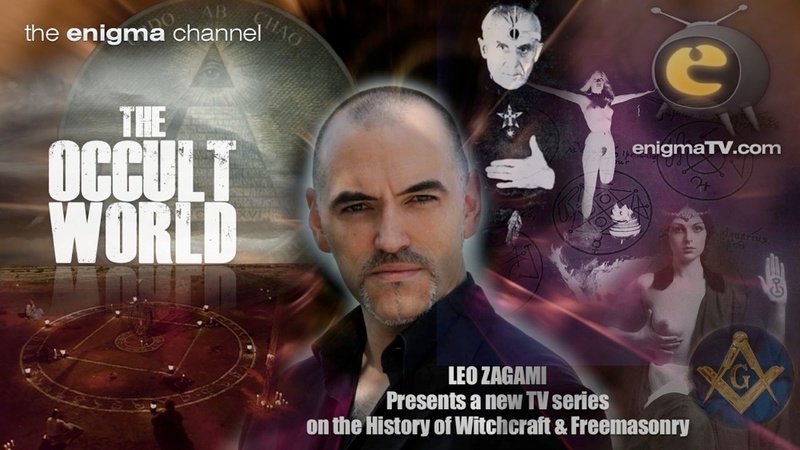 I then made a series of films about the covens, cults and secret societies who have seeded their members into influential jobs in government and the Media. Since then, 10 million visitors and subscribers have flowed through my websites, and more than one billion people have watched my films. Welcome to the Global Awakening. 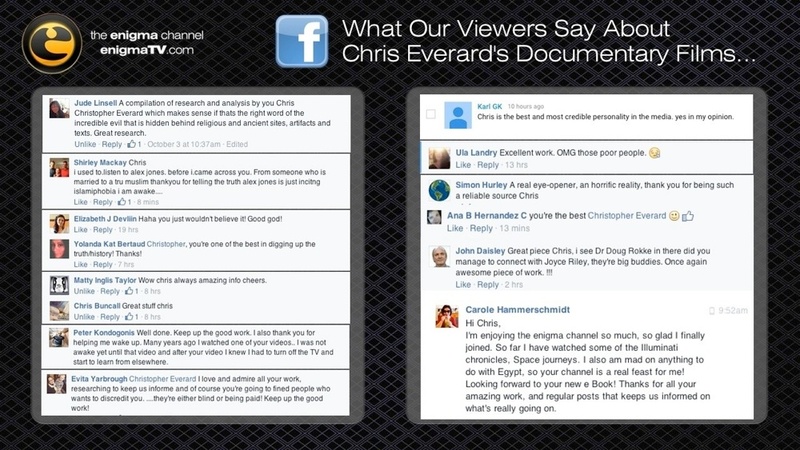 Welcome to The Enigma Channel. TOS: The Enigma Channel operates an ETHICAL ADVERTISING Policy. No Pop-up ads. Movies are never interupted with ads. We give $30m of free ads every year to Whale & Dolphin conservation. This website offers documentary films and related media under the auspices of the Fair Use guidelines, and the relevant certification of our broadcasted materials is certificated as E Exempt From Certification unless otherwise stated. We do not take responsibility for the third-party provided Content which may appear as a result from our HD Search Engine or material uploaded to third party services which integrate with our own intellectual property. Infringers who knowingly use this Online Informational website service shall be reprimanded. 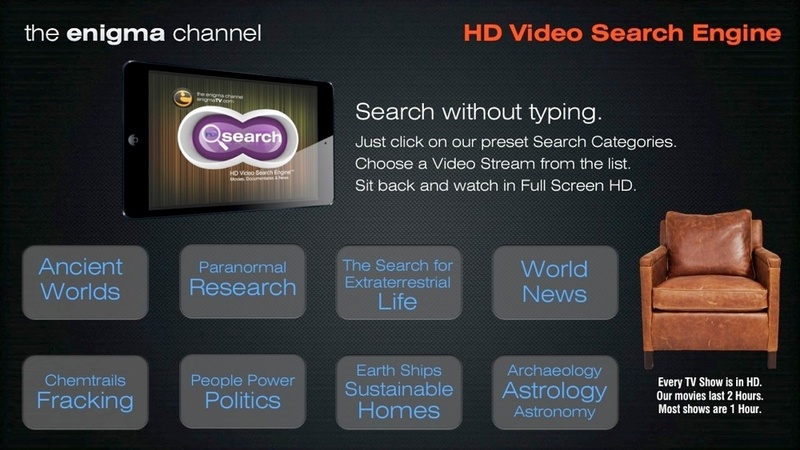 This website is a premium paid-search facility specialising in HD quality documentaries. We are a registered Online Service Provider and an Intermediary according to the terms of the DMCA, Digital Economy Act & EC Directive. 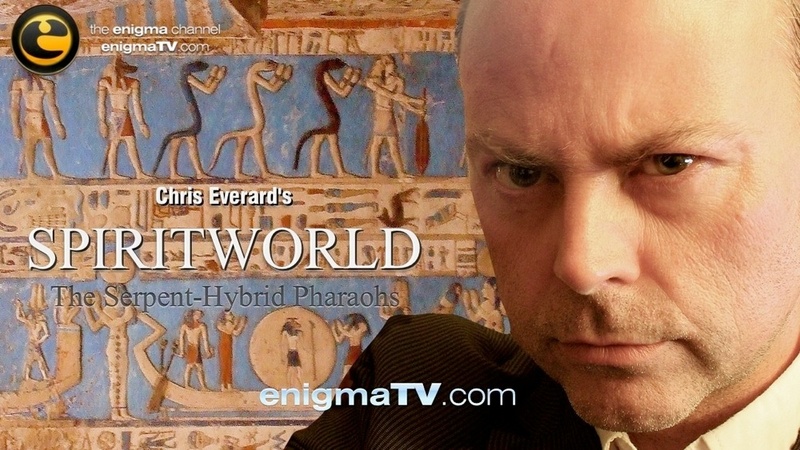 Premium account holders are allowed to use our Enigma Video Search Engine which trawls and crawls the internet 24 hours a day indexing high quality HD documentaries about a wide range of subjects such as Astronomy, Astrology, Alchemy, Archaeology, Egyptology, Acoustic Levitation, Cymatics, FPV RC Systems, Physics, Psychic Research, Extraterrestrial Archaeology, Space Exploration, Conspiracies, Political Scandals, Human Trafficking, Martial Arts, Reiki, Chi Gong, Mediumship, Vedic Astrological Forecasting, Solar Power, Wind Turbines, Edgar Cayce, Nikola Tesla, Sumerian Language, Archons, Angels, Demonology, Kabbalah, Merkabah, Prophecy, Paganism, etc. Apart from our own in-house Content, all material is sourced from video sharing websites and is available as streamed Program Pods in non permanent caches which expire in accordance with the Premium Search fee paid by this website’s users. Original copyright remains the property of the authors of those works. Copyright infringement notices should be directed towards the video sharing websites and/or torrents which are crawled by our search engine in first instance. 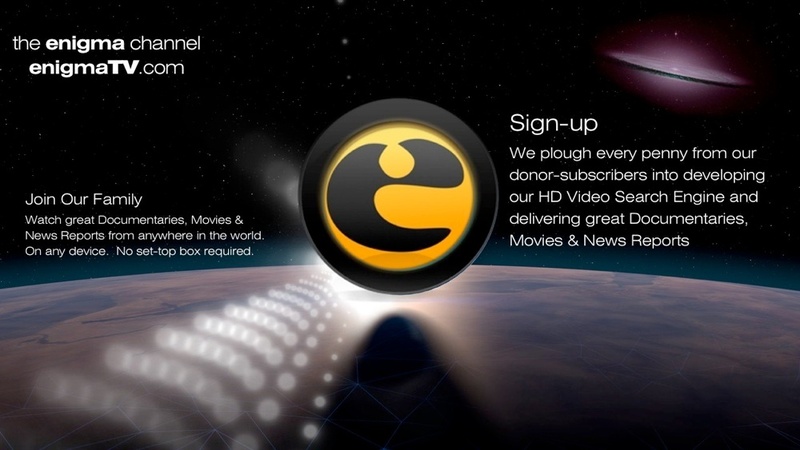 the enigma channel, enigmaTV.com, zapTV, TheMovieCloud.TV & enigma motion pictures are Premium Search & Indexing Services & registered as Online Service Providers under the Fair Dealing provisions of English Law. Wholly owned by the enigma foundation for arts & sciences™ administered by agent Christopher Everard™ ® © 1997-2013 all rights reserved. Infringement & Search Technology & our Designated Agent: Nearly every Search facility will come across infringing material and we make strenuous efforts to identify which elements of the material are Orphaned Works and which may be infringing. Design & Photographic elements may appear on this website supplied by third parties who are either freelancing or not employed by the Operator. The best procedure is for copyright owners themselves to send us confirmation of the ownership of allegedly infringed works.The DMCA‘s safe harbors provide protection from liability for [service providers engaging in]: (1) transitory digital networking communications - which infers Search Technologies; (2) system caching; (3) information residing on systems or networks at the direction of users; and (4) information location tools. This OSP is eligible for any one of these four safe harbors, and meets certain threshold conditions. * We operate a policy of disciplining infringers and accommodate copyright holders who seek to protect their copyrighted works through the provision of this messaging link for Takedown Notices here. Messages shall be read by our designated agent for receiving infringement notices regarding copyright and DMCA notices in this provided link (above). Upon gaining actual or constructive knowledge, we shall maintain safe harbor, provided our designated agent acts expeditiously (for example within 36 hours) and removes access to the allegedly infringing material. We clear-flow all caches and will remove any long-term cached/hosted material upon suitably sufficient notification in accordance with EC Directive 2002. Malicious misuse of the provisions of the Copyright Act in an attempt to have materials removed which are NOT the intellectual property of the Notification issuer shall be contested and may lead to prosecution and/or corporate governance & administration fees. Launched at the Royal Television Society in 1999, we are a registered non-profit foundation for the Creative Arts & Sciences. A global family of Angel Investors regularly contribute to our British Film Fund. All proceeds are invested back into making high quality Documentaries & Movies. Find out how you can contribute and benefit from tax deductions here. Fair dealing for a permissible purpose? None of the original content presented on this website has been produced by the host, but by a third party. In general English Law, Copyright Acts in Berne territories permit fair dealing defences for the production of Documentary films and factual-based television shows, as long as these films and television productions fall within the boundaries of what is considered to be 'legitimate' amongst fellow peers in those industries. Five types of fair dealings are permissible under multi-jurisdictional English Law when regarding bona fide proper documentary works which contain pictorial elements of originality: (1) private study, (2) research, (3) criticism, (4) review, and (5) news summary. 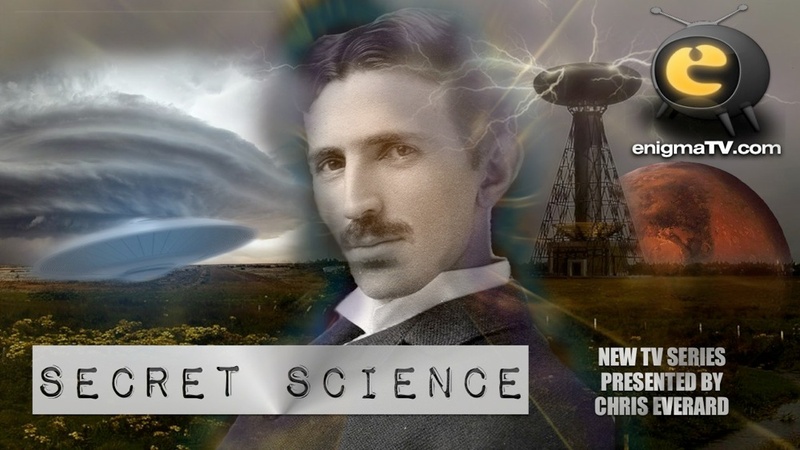 The Documentary films & television shows presented via search indexing and direct broadcast on this web portal, by their nature, fall squarely within the ambit of many of these purposes . “Criticism”, for example, does not mean criticism in the academic or literary sense, but should be interpreted to include critical commentary, challenging viewpoints, and even parody when undertaken with a genuine intent to criticise the parodied ... Similarly, “review” should be interpreted to include not just commentary on artistic merit, but factual review and disclosure of facts and events. “News summary” should extend beyond the evening news and morning paper to benefit documentaries that pull together facts and events. Note: the Canadian provision is not limited to reporting on current events, as it is in such jurisdictions as the United Kingdom and New Zealand. In all fair dealing presented herein, the emphasis is on the expression’s factual or historical nature. Unless deemed to cause confusion, original credits have been maintained on fair dealt materials. Six factors that are to be considered by the courts in determining the fairness of a given dealing : (1) The Purpose of the Dealing: Courts will make an objective assessment of the filmmaker’s real purpose or motive in using a copyrighted work, not their subjective belief - this is self evident that this is a documentary and news orientated service with minor elements of 'entertainment'. (2) The Character of the Dealing: Courts will examine how a copyrighted work is dealt with especially the custom or practice in a particular trade or industry. Copyright, Designs and Patents Act 1988 (c . 48) s . 30 . In The Newspaper Licensing Agency Ltd. v . Marks & Spencer plc,  (3) The Amount of the Dealing: Courts will examine both the amount of the dealing and the importance of the copied selection to the work allegedly infringed. With a bona-fide documentary film, in which multiple elements, constructive criticism, public information, diverse viewpoints, conflicting and contrasting evidence, factual matter and original scripting, narration and photographic elements have been created by the documentarian, even an entire work may be fairly copied in some cases - though this does not permit wholesale ripping, selling, nor dilution of the intended market.4) Alternatives to the Dealing: The fair dealing in footage in this web portal of documentary films and television shows is a dealing which is reasonably necessary to achieve the (new) work’s purpose and there is in most cases no other alternative to dissemination of the information. (5) excepted (6) Effect of the Dealing on the Work: A reproduced work that substitutes for, or competes with, or interferes, or reduces sales of, or denigrates, or harms the market of the original work is never held to be 'fair'.